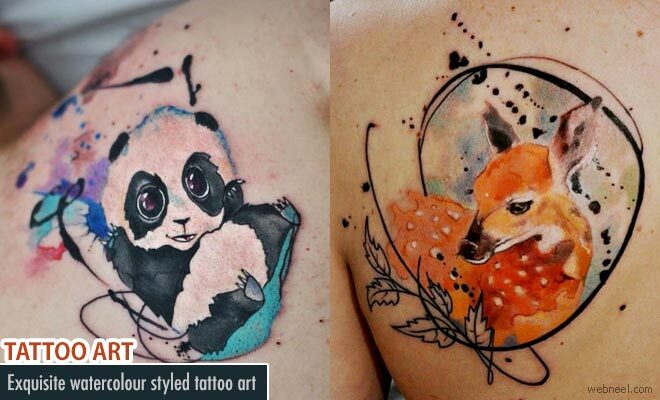 TATTOO ART : Aleksandra Katsan is an artist at Tattoed Paradise, a tattoo studio in Kiev, Ukraine. Exceptional brushstrokes as well as unique splatters of pigment in her body art designs is mindblowing combination. Water colour painting and tattoos are two different pair but Aleksandra has marked a niche in this combo in a special style which brings realistic look to the art. She is inspired by nature and loves to create adorable birds, flowers and even pandas. The mixing of colours and texture to her creations are also influenced by nature and hence gives an eternal joy to the viewer. Truly treating the human body as a blank canvas, Aleksandra Katsan's work is full of vibrant colors and bold strokes.